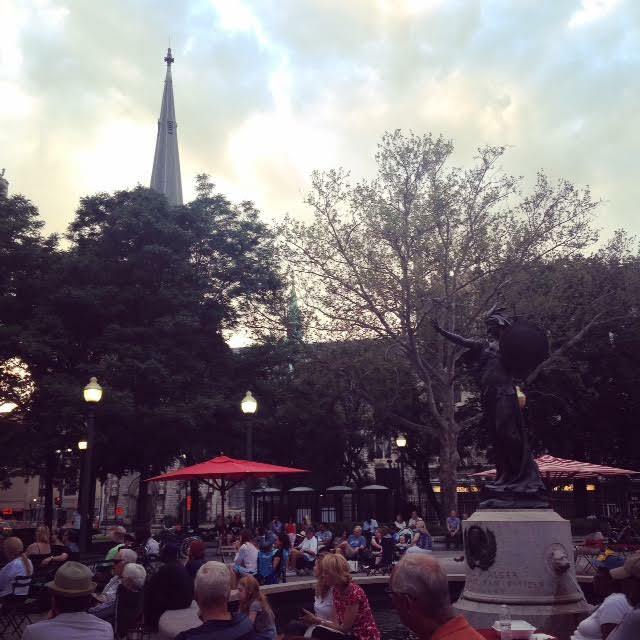 Last night, on the eve of the 314th anniversary of Detroit’s founding, we went to Grand Circus Park to see some opera singers — a preview of the Michigan Opera Theatre’s 2015-2016 season, with selections from La Boheme, Verdi’s Macbeth, and The Magic Flute. It was a perfect picture of this moment Detroit, a time of “activation,” of places adamantly “made.” Before the show we had a drink at the perplexing but pleasant beach at Campus Martius. We strolled through the lobby of the newly-restored David Whitney Building, now an Aloft Hotel. At Grand Circus Park there are perky red umbrellas, bistro chairs, a dog park. Downtown Detroit is so suddenly so different, and yet it’s already hard to imagine what things were like such a short time ago — block after block of vacant storefront, so much potential so long unrealized. I thought about my first forays into Detroit history, tramping around downtown with a copy of A History of Detroit for Young People, taking the self-guided tour that Harriet and Florence Marsh wrote for school kids in 1934. Six years later and the monuments haven’t moved, but the city they live in is more bustling by the minute. From my 2009 (!) self-guided history tour of Grand Circus Park. At the park there were couples with picnic baskets, women in long summer dresses, men in business suits, a small child in a striped yellow dress dancing with a stuffed rabbit. Young people and old people, black people and white people, people just strolling through walking their dachsunds, people stopping to listen or not stopping to listen as they walked to or from their bus stops. David DiChiera, the founding director of the Michigan Opera Theatre, was there. Stephen Henderson, editorial page editor of the Detroit Free Press, was there, too. In 100 years, researchers working on biographies of these men might like to know they heard music in Grand Circus Park on a breezy July night in Detroit. Perhaps those studying the career of handsome tenor Aaron Blake would like to know that he wore a polka-dot shirt and made a little pun about Macbeth and McDonald’s, a sponsor of the evening’s program. Sometimes I am cynical about what’s happening downtown, the piped-in “cool” music and the fake plants and the food trucks, the rush to “rebrand” places that had pretty good brands to begin with before anyone hired a graphic designer to make a sandwich board about it. But there was something in the air last night, a presence of the past. Maybe it was just the music (La Boheme premiered in 1895) or the rushing of the fountain (unveiled in 1921) or the exquisite park, a bisected emerald in the heart of the city (it dates to 1805, the year it was drawn up in August Woodward’s extravagant street plan). Maybe it’s because it’s so much easier to imagine the people of the city past when there are lots of people milling around in the city present. And maybe — JUST MAYBE — it’s because I drank too much wine. But as I thought of all the people who, 100 years ago, may have walked through Grand Circus Park with their dogs, or danced with their kids, or sat by the fountain and watched the pigeons, or maybe even heard some opera music, I felt a profound love for them, and for the 314-year-old city, and on the drive home I teared up a little, like a total cheeseball. Every year I think, “Is this a year where I need to write a thing for the birthday thing, is that still who I am?” This year, it is, and I am. Our history makes us who we are today. Happy 314, Detroit. May we continue to build on the things we have that make us who we are: our parks, our buildings, our rivers, our streets, our art, our music, and our memories of each other. 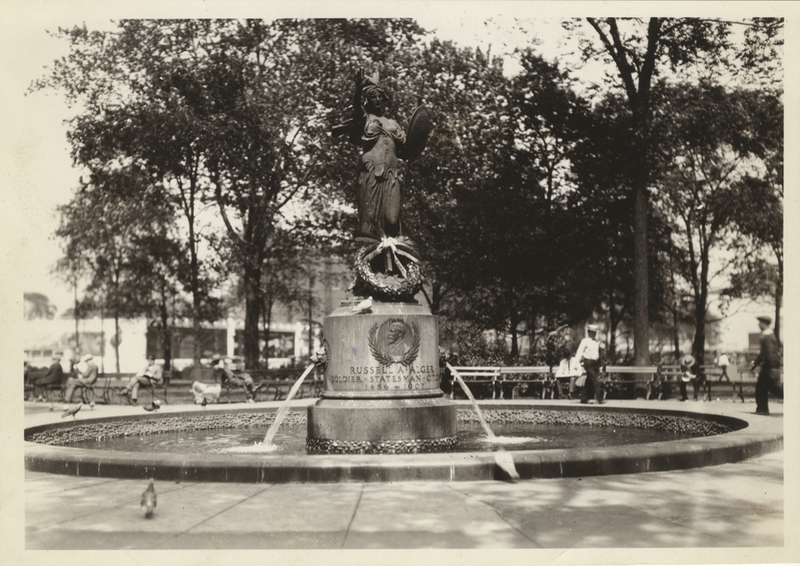 Russell Alger Memorial Fountain, photographed in June, 1929. Via the Detroit Public Library. I’ll be speaking tonight (that’s Saturday, July 25) at the Detroit Drunken Historical Society’s Detroit Birthday Party. Previous reflections: On Detroit’s 313rd and Detroit’s 310th.